I finished my fingerless mittens yesterday. Super quick and fun knit! The pattern is Chasing Circles. The instructions say to use size 6 US / 4mm needles, but I used a size smaller so the mittens fit my small hands. The yarn is Madelinetosh DK, color Lettuce Leaf. I had it leftover form another project. They only took 46g of yarn! Can’t beat that! I absolutely adore this color, but it’s been discontinued! Can you believe it? What a disappointment. I have 3 skeins of sock weight waiting for me at my mom’s house in California which I bought from a couple of people destashing. I’m so lucky to have found it! It will become a sweater at some point. 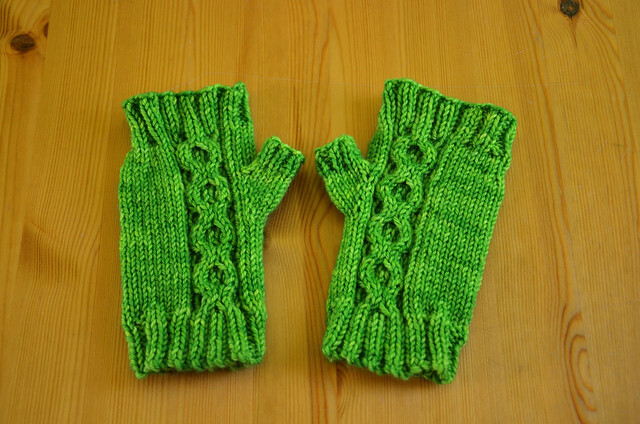 Only 5 people on Ravelry, including me and the designer, have made these mittens. I for one will recommend them to others. They would make quick nice gifts too! Previous Name That Sock Contest! Ooh, I like these mitts! Have you changed something in your settings? I can suddenly read your posts in Google Reader rather than having to go to the blog itself. 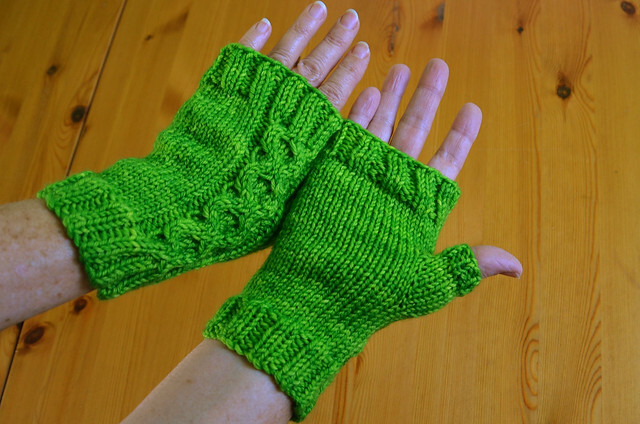 Lovely mittens – and I don’t know about Holland, but it’s still cold enough in the UK to need them! Thank you for clicking through to the blog all that time! It’s been so cold here too. Today was a little bit warmer, but not much. I keep hoping that this means we will have a real summer this year.